Leeds United boss Marcelo Bielsa says his side "paid a high price for a tactical mistake" as the Championship leaders' unbeaten start ended with a surprise home loss to Birmingham City. Leeds halved the deficit through Ezgjan Alioski's low strike in the closing stages, but Garry Monk's side held on against his former club. "The proposal I chose for this game at the beginning was not the right one," Bielsa said. "We could not make the link between defence and attack because [Kalvin] Phillips could not receive the ball. "Phillips had to assume the consequences for the mistake I made. When I corrected the mistake, the rival had already scored two goals. It is a high price to pay for a tactical mistake." 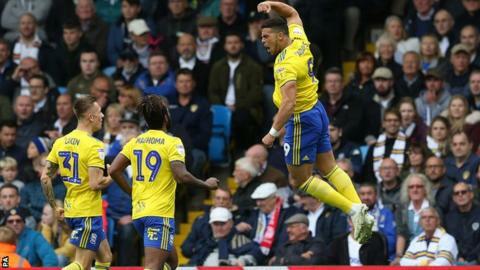 Bielsa replaced Phillips with Stuart Dallas in the 34th minute and Leeds rallied in the latter stages but were unable to complete a dramatic comeback. The defeat was the Argentine's first in the league since taking charge of Leeds, who remained without injured strikers Kemar Roofe and Patrick Bamford but dominated possession. However, Bielsa's side stayed top of the table on goal difference following second-placed Middlesbrough's draw at home to Swansea City. Adams' double was his maiden brace in the league for Birmingham and gave them a first victory in all competitions since the final day of last season. Monk, who resigned as Leeds boss in May 2017, had seen his Blues outfit draw six of their previous eight league matches before Saturday's win. "I am very proud of the players, they deserve that," he said. "We have performed well all season and outplayed a lot of good teams. We [had been] very unfortunate. "To come here against the league leaders, at a stadium with a fantastic atmosphere, the players were magnificent. I am pleased for them and the fans. We got what we deserved." Match ends, Leeds United 1, Birmingham City 2. Second Half ends, Leeds United 1, Birmingham City 2. Foul by Ryan Edmondson (Leeds United). Corner, Leeds United. Conceded by Lee Camp. Attempt saved. Stuart Dallas (Leeds United) left footed shot from outside the box is saved in the bottom left corner. Assisted by Ezgjan Alioski. Adam Forshaw (Leeds United) is shown the yellow card for a bad foul. Maxime Colin (Birmingham City) wins a free kick in the attacking half. Attempt saved. Ezgjan Alioski (Leeds United) left footed shot from outside the box is saved in the bottom right corner. Assisted by Stuart Dallas. Attempt blocked. Samuel Sáiz (Leeds United) right footed shot from outside the box is blocked. Assisted by Ezgjan Alioski. Substitution, Birmingham City. Wes Harding replaces Jota. Corner, Birmingham City. Conceded by Liam Cooper. Goal! Leeds United 1, Birmingham City 2. Ezgjan Alioski (Leeds United) left footed shot from the left side of the box to the bottom right corner. Assisted by Samuel Sáiz. Kristian Pedersen (Birmingham City) is shown the yellow card. Substitution, Birmingham City. Omar Bogle replaces Lukas Jutkiewicz. Corner, Birmingham City. Conceded by Ezgjan Alioski. Corner, Leeds United. Conceded by Maikel Kieftenbeld. Attempt blocked. Stuart Dallas (Leeds United) right footed shot from outside the box is blocked. Assisted by Ryan Edmondson. Adam Forshaw (Leeds United) wins a free kick in the attacking half. Offside, Leeds United. Luke Ayling tries a through ball, but Stuart Dallas is caught offside. Corner, Leeds United. Conceded by Michael Morrison.